This is mainly from comments on Bob Price’s Sunday post. 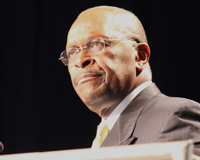 The question of Herman Cain’s position and statements on abortion and the relevant issues are critical, both in terms of the morality of this particular question, and in terms of the proper legal structure of the American republic. Let me say to begin with that I am a Cain supporter. I would certainly hope to be objective. But whether my sentiments affect the clarity of my reasoning, will of course be for the reader to decide. First, some will suggest that the structure of law in this country is irrelevant unless it demonstrably changes the ultimate behavior of people, and I beg to differ. There is a proper legal construction to consider, and dismissing its importance affects both the overall integrity of and respect for the law, and the lessons taken from individual cases. However wisely or shortsightedly we may project the behavior of some people, there is an obligation to obey proper methodology in both the construction and the enforcement of the law. In addition to its punitive one, law has a a didactic force. Subsidizing the integrity of the law to some calculation of generally "getting food on the table", particularly in this, which is STILL, believe it or not, a land of relative plenty, I find hideously crass and vulgar. Now as to Cain's abortion position, here again I find a lot of worth in his posture, but also a failure on the part of a bright and practical executive, to communicate the value of what he's saying to people who are more concerned with easily digestible pictures and sound bites than in the elegance of the policy projected onto a renewed society. Let me begin with a description of myself and my position which I suspect is practically very close to Cain's. I am very pro-life, and not only in revulsion at the behavior of individuals' treatment of any human life, let alone that of their own progeny, as matters of their convenience. This disposition and frankly our tolerance of it, portends a society that will fade in its overall civility over time. And while people divide supposedly "moral" and "fiscal" issues, it's no surprise to me that a society that devalues human life right down to its own offspring, will inevitably manifest the same impetuous selfishness fiscally. This nearly bottomless selfishness is a social sickness unto death. I have worked with the 2 largest pro-life advocacy groups here in Houston, obviously among the largest and most active in the country. But while I would cheer its achievement, I don't primarily advocate for a US constitutional amendment banning abortion. Why? Two reasons: 1) If you can even imagine the most unlikely prospect of an anti-abortion arm of the FBI, it would do more harm than good, and won't accomplish what we need. We need a change of attitude in society. This option would only make the disfavored attitude more fierce and make a commonplace of law-breaking. 2) Whenever we actually did make considerable progress on the enactment of an amendment to The US Constitution, we would have already achieved that change in public attitude of which I spoke. When achieved, a constitutional amendment would not cause a change, but be a manifestation of a change we had already accomplished. Bottom-line, I think Cain feels as I do about the horror of abortion. But I think he also sees the reality of our legal structure and the proper limitations of FEDERAL government. I think abortion should be against the law, but as an expression of the fellows of the nearest community. "We" think this is right or wrong, not some far off executive, legislature or judge.